Takeaway: We are proud to announce our latest contributor: AGS Safety & Supply! Here at Safeopedia, we are always looking for knowledgeable and reputable contributors who can provide high-quality articles, Q&As, and safety moments for our visitors. Today, we are happy to announce that Safeopedia readers can look forward to new and exciting content from our latest contributor, AGS Safety & Supply! AGS Safety & Supply was founded in 1981 by James Lara. From the early years to the present, the focus of the company's mission has been the importance of the customer. AGS sets the standards in Arizona for customer service in the safety industry, with a commitment to integrity and competitive pricing. Based in Tempe, Arizona, the company boasts a warehouse operation doing business coast-to-coast, with tens of thousands of stocked items and the largest inventory of safety equipment in their state. AGS offers customers a one-stop shop for personal protective equipment (PPE). These product catagories include the quality products needed for eye protection, head protection, fall protection, respiratory protection, hand protection, and footwear from a range of manufacturers, including 3M, Carhartt, Honeywell, Pyramex, and Radians. AGS also has a unique section of their business that addresses facilities maintenance for customers in a way that goes hand-in-hand with PPE. These safety products include everything from safety mirrors for visibility throughout the project in high or low areas and around corners to batteries, flashlights, blowers, pelican cases, janitorial supplies, and signage. 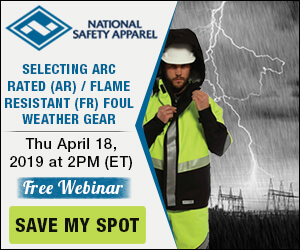 Customers needing high-visibility clothing will find several styles of vests, jackets, shirts, and gloves that make it easy for employees and the public to identify workers on the job. AGS also makes it easy to stay in compliance with products that address spill response preparedness, first aid and eye wash, gas detection, and traffic and road safety. In the case of emergency preparedness, they offer a range of sorbent products, such as socks, pads, chems, and berms. These products present strategies for measuring, assessing, and containing contamination on the job site. Above all, the entire staff of AGS is dedicated to making sure customers are satisfied and have a positive experience every time they call or place an order.